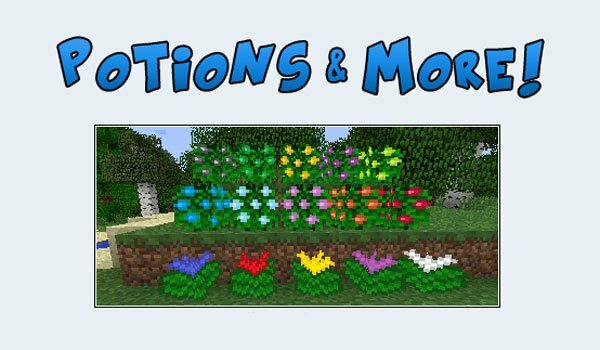 Potions and More 1.5.2 adds up to 14 new crops to frarm for getting 14 new ingredients to develop new potions. This new foods let you craft up to 50 new kinds of potions. To begin must find the new mob added in this mod. Is a farmer that found in swamp biomes, he’ll give you new random seeds of several bushes, in exchange for gold bullion. Planting the bush get berries to craft potions. On the other hand seeds of new plants can be collected, breaking tall grass. So we get up to 5 types of plants that can grow petals, to use as the basis of the potions. Using diferent combinations when crafting potions, you can get regeneration, fire resistance, healing, damage resistance, night vision, invisibility, motion, antidote, damage II, regeneration II, movement II and many others. How to install Potions and More Mod for Minecraft 1.5.2? Paste Forge files within “minecraft.jar”. Cultivate new ingredients and make potions in Minecraft!